At Cranborne Middle School, we are very proud to offer pupils and staff a full dining experience. 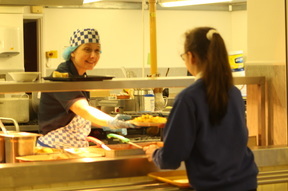 Unlike many other schools, the catering department is run in house in order to promote local and high quality produce, as well as freshly cooked meals. “Crumbs” Café starts service at 10.20am when we provide a range of hot and cold snacks. The selection of items to purchase varies from day to day with prices starting from 10p. During the winter months, we also offer hot chocolate, which is always welcomed by the children as they come in from the cold playground. Lunch is served from 12.20pm with a choice of a bowl of fresh pasta or jacket potatoes with a choice of toppings or a wide selection of seasonal sandwiches and rolls – all of which are very popular. All of the above offer excellent value for money with prices starting at £1.20. All of the meals and drinks available comply with the School Food Trust standards and we have been awarded the highest grading (5 stars) from the Food Standards Agency.